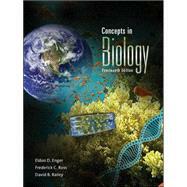 Enger/Ross/Bailey: Concepts in Biology is a relatively brief introductory general biology text written for students with no previous science background. The authors strive to use the most accessible vocabulary and writing style possible while still maintaining scientific accuracy. The text covers all the main areas of study in biology from cells through ecosystems. Evolution and ecology coverage are combined in Part Four to emphasize the relationship between these two main subject areas. The new, 14th edition is the latest and most exciting revision of a respected introductory biology text written by authors who know how to reach students through engaging writing, interesting issues and applications, and accessible level. Instructors will appreciate the book's scientific accuracy, complete coverage and extensive supplement package.